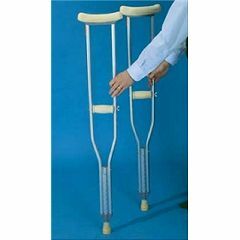 The Axillary Crutch is one-piece extruded. Strong and rigid. Push-button height adjustment. Hand-grip adjusts. Includes underarm pads, handgrip pads, and extra-large crutch tips. Small fits 4'6" - 5'2"
Regular Adult fits 5'2" - 5'10"
Tall Adult fits 5'10" - 6'6"